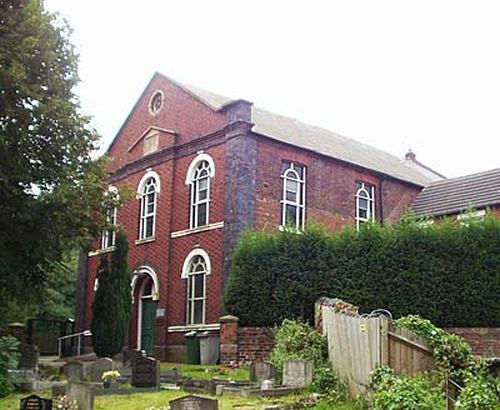 Oakengates and Wrockwardine Wood were the first places in Shropshire where Primitive Methodists established congregations. The plaque on the side wall of this chapel commemorates the first chapel built here in 1822 and opened in 1823. It was reported in 1851 that it held about 500 worshippers, and that the building & fittings cost £498. At its most well attended service on Census Sunday 1851 it had 405 worshippers, plus 334 Sunday scholars. It was replaced by this large red and blue diaper pattern brick chapel in 1863, whose foundation stones were laid on the 17th August. There is a large burial ground in front of the chapel which has recent gravestones in it. The chapel was still in use in 2003 but has now (2016) closed. For a view of the plaque on the front gable, click here.